It is March! It is Madness! Do you follow college basketball? Have you filled out your bracket? Are you entered in a pool (not the swimming kind)? My answer to all three questions is no. My most favorite thing about sports though is the camaraderie and food surrounding the events. The food usually involves something you can stuff directly in to your mouth using only one hand because the other hand obviously is holding an ice cold beer. Sports food, depending on the sport/season, is usually grilled meat, something cooked in a crock pot, pizza, chicken wings, or snack type foods. And I love them all. This snack mix makes a ton. I mean you need to mix it up in a garbage bag there is so much snack mix going on. Which is perfect if you are planning on having a sports watching party. My sister-in-law makes this for Christmas every year and we munch and munch on it throughout the holiday. I figured it would make a wonderful snack to bring to a sports watching party. I made it and brought a gallon ziplock bag over to the neighbors’ house for the Super Bowl. Pull out your unscented -this is important! 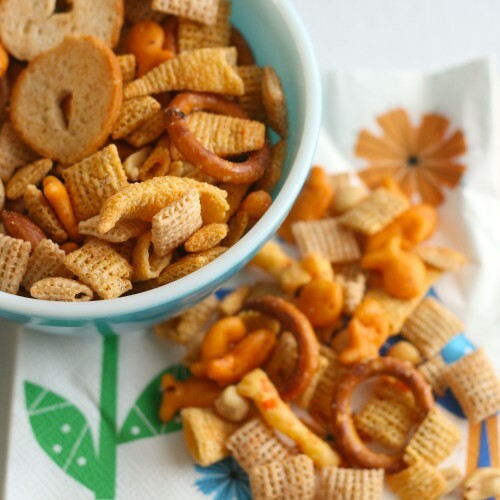 garbage bag and mix yourself up a batch of this snack mix to enjoy while you are cheering on your favorite team. If you’re interested in watching my teams play Nebraska plays Baylor at 11:40 central today. And Creighton plays Louisiana at 2:10 central today. Go Huskers! Go Jays! According to the sports dude on the news if both Nebraska teams win it looks like they will play each other, which would be exciting. Go team! 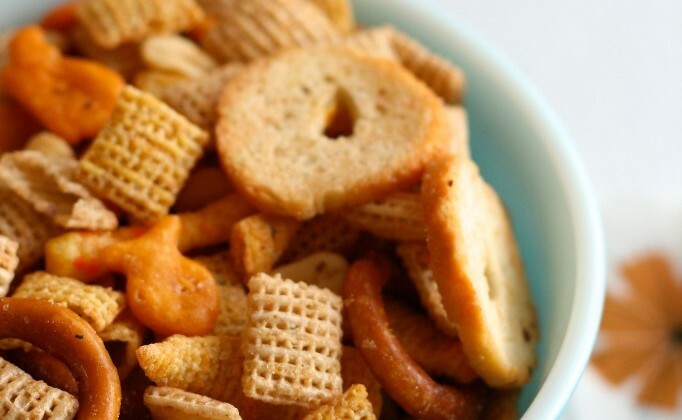 Change this snack mix up with your favorite add-ins. There are other options for the shaker of popcorn seasoning. Let me know if you try a different combo! Personally I am tempted to try the Nacho Cheese or the Cheesy Jalapeno flavor. Pour all through mixed nuts ingredients in a big (unscented) garbage bag. Shake it up to combine. Pour bottle of oil and popcorn flavoring over everything. Shake, shake, shake it up! Transfer snack mix to gallon ziptop bags and let it dry a bit before closing the bags. This mix makes about 5 gallon bags worth. Ok, I love the idea of making my snacks in a garbage bag! Perfect party food! It sounds crazy but it is the only thing big enough in my kitchen to fit in all the ingredients. Girl, if this was near me, the bowl would be finished! 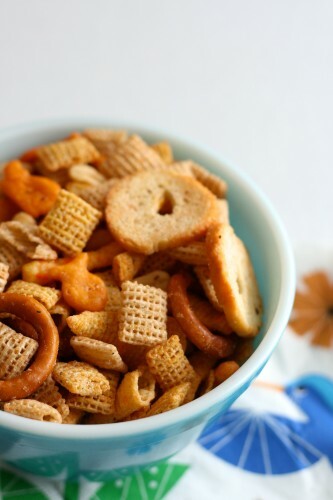 I love me some snack mix! This stuff is totally addicting! The only way I can stop munching at Christmastime is to physically leave the room. I made this last year for Christmas and it made the most wonderful, homemade Christmas gifts.. I had a few people asking for their own bag even though it was meant to be a family gift…I made four batches of this and it became a new tradition for my kids and I.. Nice thing about this recipe you can tweek a little bit to match your tastes. I substituted pizzeria combos for the fish crackers.. and for people that cannot have nuts, you can make a batch with no nuts.. Finally, if you are making large amounts, if you plan it just right.. You can start buying the ingredients months in advance, as long as you stay in the expiration date.. I started buying the supplies back in July, and most of the ingredients have a shelf life of six months.